Since moving to Vancouver, I’ve had the pleasure of eating Meat and Bread’s porchetta sandwich. I saw the guy at the counter chopping up this big hunk of porchetta and that picture stayed in my mind. That was two months ago. So yesterday, I hosted a small dinner for my friendly neighbours. It was the perfect opportunity for me to make porchetta because in this household where vegetarianism is more of a norm, I rarely get the opportunity to make roasts for dinners (unless it’s roasted vegetables, which I also love but that’s not the point). This was my chance! Merrily, I went to Big Lou’s Butcher Shop to get myself some pork loin and belly. The guy at Big Lou was like, “Ohh..we might have a cut where the pork belly is still attached to the loin”. That is the cut Meat and Bread uses for their porchetta! I was elated. Five-point-five pounds of porkage later, I was home and ready to start. I realized that the butcher didn’t exactly cut the pork properly for me. The pork belly end’s width was smaller than the loin end so I cut about 70% of the pork belly section out and rolled it as a separate roast. I had the taste of the M&B’s porchetta in mind but I needed some guidance on the temperature and method. 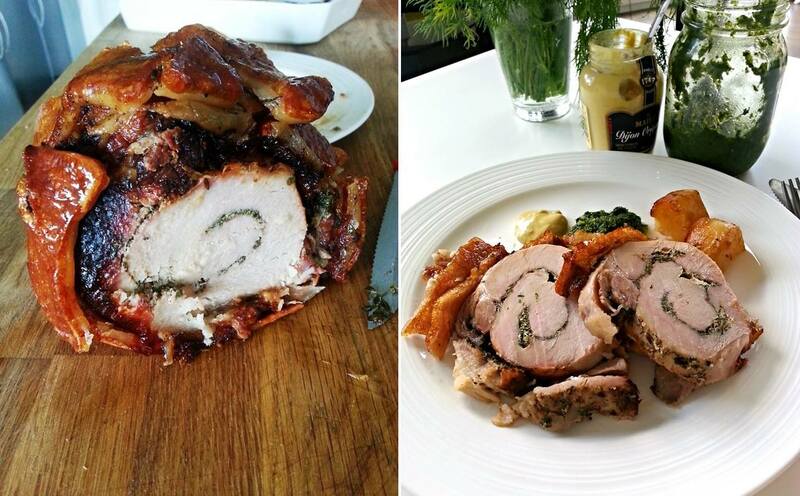 So I found iamafoodblog.com’s porchetta recipe and boy, did her porchetta looked good. I checked out her method, found out the temperature she used and decided I’m going to adapt the recipe a tad bit but keep the same cooking method. It was similar to my aunt’s roast pork method anyway so it made sense. Please note that you need to start preparing the pork 24 hours before serving for the best results. You will need twines to tie the pork up (ask your butcher for them). Paper towels to dry the pork skin. Toast all your spices first before pounding them. To maintain a lovely green pesto, blitz the herbs, seasoning and lemon juice first and then stir in the oil. Make sure your porchetta is not fridge cold when it goes into the oven. If you have convection setting in your oven, use it.